The people were so nice! It was easy to make friends, including with the staff! The hostel is in an amazing location in the middle of Cádiz and it had a really chill vibe :) definitely would stay again! Thanks! One of the nicest hostels I’ve ever stayed in. You could smell how clean it was when you entered. I stayed in a private room with my other friends and we had a balcony which was very nice. Staff was kind and the breakfast in the morning was a nice start to the day. A really wonderful hostel! The hostel is pretty central so everything is walking distance. Breakfast was pretty good as well, and there were plenty of restrooms and space for everything. The best part for me was how comfortable the bed was - I was genuinely surprised. 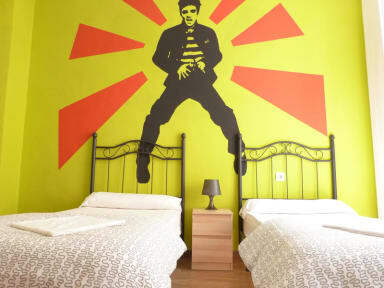 I highly recommend this hostel to anyone traveling to Cadiz. Hostel is overall great, the only problem is that there is only one shower for men at each floor, so that can become quite crowded. The facilities, convenience, and location were all great - the only negative was that the staff seemed more focused on enjoying themselves than providing for the guests. It’s great that the group of staff are having a good time, but for someone staying on the first floor, they stayed up in the common area partying and being loud very late and were loud in the morning as well. They took up the whole kitchen cooking for themselves as well. Nice place. A little hard to find in the streets. Look for the two flags. Staff was friendly, but not exactly the most knowledgeable about the city. Men's shower/bathroom situation was a little strange too, but it's a really pretty building inside and has a good/fun atmosphere and friendly staff. My friend and I only spent one night here. It was pleasant, nothing to complain about. Staff was amazing, great vibe, rooftop terrace was a huge plus!